Houston went wild last Wednesday night, when the Houston Astros defeated the Los Angeles Dodgers in the 7th and final game of the World Series, winning 5-1. To fully enjoy the victory, the city shut down on Friday and held a parade through the city streets, culminating in a presentation and speeches of accolades on the steps of Houston City Hall. 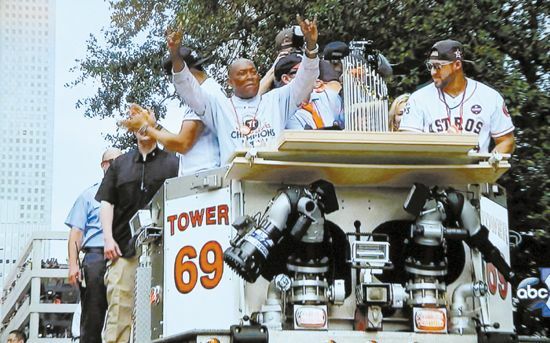 Police Chief Art Acevedo estimated that over 500,000, and perhaps as many as 1 million persons lined the streets as the Astros team, riding fire trucks, went down the parade route. The Houston ISD school district cancelled all classes on Friday, and students went to the parade. The series itself set or tied many records, including longest game (5-1/2 hours in a slugfest in the fifth game) and most home runs (25) in a series. Everyone agreed it was one of the most exciting and entertaining baseball playoffs in memory. Both teams played outstanding baseball. The Dodgers had won 104 games in the regular season, and the Astros 101. Astros George Springer was voted Most Valuable Player, hitting 5 home runs. In the World Series, the teams split the first six games, alternating wins and heightening the drama. But the Astros prevailed in the final seventh game, with George Springer starting the scoring in the first inning, and the team leading throughout the next nine innings. The final 4 innings were pitched by Charlie Morton, holding the Dodgers to no runs after one earlier run. Festivities continued after the final victory, with romance the theme. Shortstop Carlos Correa proposed to Daniella Rodriguez, 2016 Miss Texas USA, on camera. Ace pitcher Justin Verlander left for Italy to marry supermodel Kate Upton. And three Astros, George Springer, Jose Altuve, and Alex Bregman participated in a skit shown on Saturday Night Live. The Houston Astros were originally the Colt 45s when they started in 1962, and now after 55 years they finally appeared in the World Series and won. Harris County and much of Southeast Texas is trying to recover from the most horrendous hurricane and subsequent flooding in the state’s history. Hurricane Harvey approached the Texas coast slowly the last week of August, and then on Saturday September 2nd torrential rains started and continued for two days. After that, the fun-off and release of damed water brought severe flooding to a number of Houston and Harris County neighborhoods. The total numbers are staggering, if not complete. The deaths from the floods are now above 40, and the total number of houses affected by flood water will exceed 100,000. 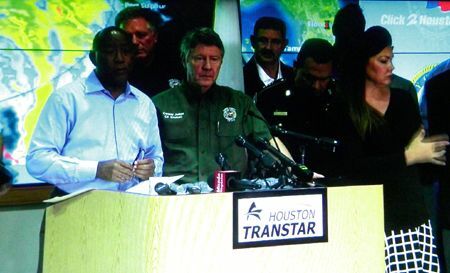 Mayor Sylvester Turner said that about 5% of the houses and Houston have been damaged by high water. Another major casualty is vehicles that were stranded in the water as it rose quickly, and this number is estimated to be above 80,000. Total rainfall for the last week is above 50 inches in most areas of Harris County and southeast Texas. First responders, such as the Houston police and fire departments, and Harris County Sheriff’s office, have made over 1000 deep water rescues, and a total of over 6000 responses to all types of calls. It is reported that as resources came into the city from other parts of Texas and the nation, the number of Coast Guard helicopters involved in rescues was 22, airplanes 3, and boats 28. In addition, Governor Abbott declared a state of emergency in 11 counties, and later added more. The hurricane first made landfall at the city of Rockport, some 150 miles west of Houston. It then proceeded on to Victoria, and then returned south, heading up the coast to Houston, and eventually Baytown, Beaumont, and Arkansas. Reports from Rockport were of heavy structure damage, with tornadoes accompanying the hurricane along its path. The governor also sent Task Force 1 and 2, specialized military units trained in storm rescues. One of these went to San Antonio, and the other was housed at NRG stadium in Houston, with a number of high water vehicles and boats. As the rain and flooding continued over the weekend, the city closed both airports. Over 200 highway intersections were reported with impassible water over the road, and this continued for several days. I-10 was closed for almost a week in several locations, including the bridge over the San Jacinto River. The rainfall was intense in some places, such as Hobby airport which reported 10 inches of rain in only 1-1/2 hours. Weather experts were comparing Harvey with hurricanes and storms in the past,specifically Allison 2001, Katrina/Rita 2005, Ike 2008, and the tax day/Memorial day floods in 2015. It was clear to them that this storm would exceed all of the others in size, duration, impact on structures and neighborhoods, and dollar amounts of damage and rebuilding. The latest estimate for rebuilding the area has risen to $125 billion dollars. The federal emergency aid agency, FEMA, has pledged much of this money, although President Trump called for a reduced budget for this agency. It will probably take action from Congress to make the enough money available. President Trump was in Texas last Tuesday, in Rockport, and last Saturday in Houston and Beaumont. Governor Abbott and Vice President Pence have also made inspections of the damage. Due to the high volume of water, the Army Corps of Engineers and the Harris County Flood Control District decided that two large dams, Addicks and Barker, could not hold back that much water without the risk of catastrophic failure, and ordered a release of water into the neighborhoods and Buffalo Bayou below the spillways. This resulted in flooding of several feet in about 10,000 homes in West Houston, according to officials. It also meant that water was in major buildings in the downtown Houston area, including Wortham Center, the Alley Theater, and their parking garage, and Channel 11 television studios. In East Harris county, environmentalists were concerned with two potential catastrophies. A chemical plant that processes organic peroxide lost its power, and flooded, leaving nine container loads of this chemical overheating, and due to explode. In fact three of them did catch fire, with minor explosions, and authorities destroyed that other six as the best method to deal with them. The other concern was strong currents and flood waters over the San Jacinto River Waste Pits, with its toxic waste “capped” to contain it. As of Monday, Sept. 4 the EPA planned to investigate the cap on-site for damage or possible releases. By the end of the week, rescued families were in 4 major Red Cross shelters, totalling about 28,000. Offers of aid and donations of goods and money have come from all over Texas and the nation. One fund, set up by Texans player J. J. Watt, has received a total of $16 million dollars, which has been used for water, food, and domestic supplies. Aug. 24, 2017 – All HISD campuses and administrative offices will be closed on Monday, Aug. 28 and all campus and district activities canceled due to the threat of inclement weather. Classes are scheduled to resume on Tuesday, Aug. 29. However, the district will continue to monitor developing weather conditions and will determine whether classes can safely resume on Tuesday. The district will make that decision by noon on Sunday, Aug. 27. All HISD campus-based activities and district events – including professional development and recruiting sessions – taking place after 2 p.m. are canceled for Friday, Aug. 25. In addition, the Houston ISD Athletic Department is canceling all athletic activities for Friday, Aug. 25 and Saturday, Aug. 26. This cancellation includes, practices, scrimmages and any scheduled games. As a precaution, all non-essential employees at school campuses and central office will be dismissed by 2 p.m. Friday. Essential employees, including facility and transportation staff, will be released at a time determined by their department. HISD officials are monitoring the weather, and should it be necessary, the dismissal time will be updated to an earlier hour. For additional updates, please monitor HoustonISD.org or call the HISD Inclement Weather Hotline at 713-556-9595. We also encourage HISD staff and parents to sign up for text alerts to receive the most up-to-date information on school closures or delays by texting YES to 68453. Please ensure your number is updated with your school. You can also follow the district on Twitter and Facebook: Twitter.com/HoustonISD and Facebook.com/HoustonISD. 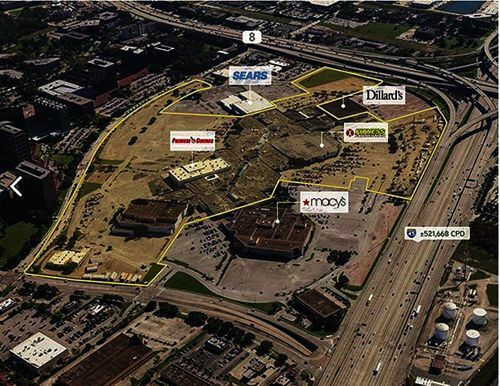 NORTH HOUSTON – Plans have been announced for a new developer to purchase the aging Greenspoint Mall, and develop it into a mixed use project. ICCH Chamber president Reggie Gray made the announcement at a chamber luncheon last week, and subsequently provided additional details to the Northeast News. Gray will be partner with two others as owners of the new development. The other partners are Feng Gao of Tianjin Liazhi Investment & Development Co. Ltd. in China, and Rain Wang of PY Group. Gao has extensive experience in developing properties in Asia, and has formed a U.S. company, WIT Union, to pursue American work. A subsidiary, Global Plaza Union, has made the offer to buy the Greenspoint Mall from its current owner, Triyar Cannon Group, from Los Angeles. Gray is also experienced in retail malls, having been a marketing executive with General Growth Properties, the owner of several retail malls in the Houston area. Gray said that after making the offer, the group will conduct “due diligence” and finalize closing on the purchase by the end of 2017. One of the problems that must be resolved is that TriYar Cannon does not own three of the major buildings that are part of the Mall. The new ownership group must attempt to purchase the old Macy’s, Sears, and Dillard’s buildings to include them or their sites in the new concepts. In the meantime, he expects the Mall to continue as a retail environment, in spite of stories that the Mall will close soon. Gray said it will take several years for plans to be developed and construction of a new type of concept for the property to be realized. He said that several concepts for a final mixed use project are being studied, and a decision will be made later. The Mall originally was completed in 1976 with 140 stores, totalling about 1.4 million square feet. 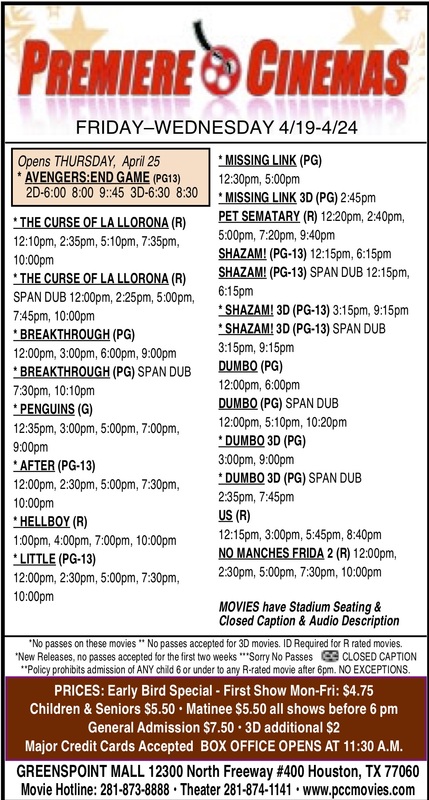 For years it was the premiere shopping destination, but finally lost out to competition from online shopping and newer malls built to the north. Several highly publicized murders on the property also hastened its demise, as people kept away for safety concerns. Gray declined to describe in detail the concepts being studied, but indicated that mixed use often includes housing, freestanding retail and offices, entertainment, and perhaps educational facilities. He is also looking for help from government and district entities to contribute to the rebirth of the property. Another sign of economic strength in the area is a huge Amazon fulfillment center that has been built in the southwest quadrant of this highway intersection. These jobs may be an indicator that housing and retail will continue to be needed in the immediate area. NORTHEAST – You could almost hear the school bells ringing, as the Intercontinental Chamber hosted their annual State of the School luncheon, a report from district superintendents on the status of their districts, and changes from last year. This year’s luncheon was held at a new Greenspoint conference center. Speaking on their districts were Wanda Bamberg, Aldine superintendent; Judy Rimato, Klein Assoc. Director of Communications; and Lupita Hinojosa, Spring chief academic officer. In addition, this year ICCH president Reggie Gray invited representatives from local colleges to report on their schools. This included Gerald Napoles, president of Lone Star College North Harris, and James Mable, Houston Baptist University director of career and calling. The reports were in general dealing with population growth and more students, except for Aldine, and results of bond issues and how that money was used. Other common topics were attendance problems, STAAR academic results, dealing with minorities, and how designation as a “District of Innovation” was being implemented. Superintendent Bamberg said her district will have 1200 less students when it opens this year, for a total of 69,000. She said this is the first time in 25 years that the district experienced a decline, and suggested it was a combination of the economy and mobility, or households moving, that caused the change. Aldine will have 77 campuses this year, including a new CTE high school. Next year it will open 8 new campuses, a result of the $798M bond issue. Some of the bond money will be used for renovations and additions, including Aldine and MacArthur High Schools. Bamberg said that she has a Community Committee working on their designation as a “District of Innovation.” One of the results of this will be an emphasis on robotics. She is also working on a Strategic Design for the future, looking at needs for the next five years, and a possible bond issue. One of the strengths of her district, she said, is the variety of choice for students, including magnet schools and partnership with YES Prep. This will be enhanced as they implement the District of Innovation. An important change in Aldine this school year if the reconfiguring or realignment of campuses, and feeder lines. Schools will be reorganized by age grouping, into PreK-K; Elementary grades 1-5; intermediate grades 6-8; 9th grade schools; and high schools. To make this work properly, the district is undergoing a complete redrawing of all their attendance boundaries. Bamberg said that they are watching the Legislative session closely, noting that so far a modest pay raise, and the apparent defeat of HB21 allowing vouchers for private schools, are positive results. Judy Rimato, Associate Superintendent for Communications, said that Klein’s motto is “Enter with a Promise. Exit with a Purpose.” This echoed the intent of all the districts, and colleges, to provide more job training and career choices, as well as academic preparation for college. Klein continues to grow, at a rate of 2% per year. They will open with 49 campuses, and a student population of 52,000. Their 2015 bond issue will provide for a new high school, Klein Payne named for the previous superintendent. Rimato spoke about academic initiatives, based on a Survey of Students conducted by Superintendent Bret Champion when he first took office. He termed this Vision Testing, and as a result, 3 Profiles were identified, which were aspirational and inspirational, Rimato said. These Profiles were summarized as Learner, Leader, and Teacher. Educational programs are related to these visions. In addition, emphasis has been placed on building personal relationships, with students, staff, and parents. Klein ISD has been designated to receive a grant from H.E.B. for a Leadership Institute, one of only 25 districts in Texas to receive this. It is a five year program, to improve teaching. She said that the high schools have strong programs in International Baccalaureate, International Business, and a new Nursing program. Lupita Hinojosa, chief academic officer for Spring AIS, reported that the 2016 bond issue of $330 million had overwhelming approval. The purchase of 60 new buses will mean 22,000 students closer to their school will be able to get a ride, improving safety and performance. The bond money will also be used for 3500 new computers, and new buildings. This includes two new middle schools, and a 9th grade center in 2020, expecting to relieve the crowding in the three existing high schools. New attendance boundaries are being drawn for the 37,000 students. Klein is also a District of Innovation, allowing more local control and flexibility. She said this will also allow better support and training for the teachers. Hinojosa’s district is putting emphasis on Attendance, attempting to make at risk students feel more involved and important. She said this will improve their STAAR ratings. Another focus is Literacy, with an expanded library in each classroom, and a Family Expo last Saturday emphasizing reading as a fundamental. Cut: SPEAKERS at the State of the Schools Luncheon included, seated, Wanda Bamberg, Aldine ISD; Judy Rimato, Klein ISD; Lupita Hinojosa, Spring ISD; standing, James Mable, HBU; Gerald Napoles, LSC-NH; and Reggie Gray, president, ICCH Chamber. Gerald Napoles, president of North Harris, said that LSC has 6 campuses and 95,000 students. Some of these are part-time, or dual credit high school students. He noted that LSC had a new partnership with Klein ISD, and an ongoing relationship with Aldine ISD, including a new campus to open in 2018 in East Aldine. He spoke about the importance of community colleges, and their availability and accessibility to a large group of students. He said LSC now has 4 year programs with bachelor’s degrees, in Nursing, Applied Technology, and in the future Cybersecurity. Napoles, a graduate himself of community colleges, noted the cost for 2 years is only $3100, while a 4 year college averages $32,000. James Mable, director of career and calling, spoke about Houston Baptist University. The school has 3300 students, and 20,000 alumni. A new college is being added, a College of Engineering, in 2018. It will offer courses in Cyber Engineering and Cyber Security, new fields nationally. Mable spoke of an emphasis on career services and preparing students for the workforce as a new focus at HBU. HOUSTON (July 31, 2017) – Senate Bill 11, commonly referred to as the campus carry law, takes effect at Lone Star College Tuesday, Aug. 1. The law relates to the carrying of handguns on the campuses of institutions of higher education and certain other locations associated with the institutions. “Lone Star College began last year gathering input from students, faculty, staff and members of the community on how best to implement this law,” said Stephen C. Head, Ph.D., LSC chancellor. “Members of the LSC Campus Carry Task Force collected the feedback and developed a proposed set of guidelines that were then approved by the LSC Board of Trustees. “We remain committed to providing a safe environment for all of the Lone Star College community,” said Head. Senate Bill 11authorizes a license holder to carry a concealed handgun on or about the license holder’s person while the license holder is on the campus of an institution of higher education or private or independent institution of higher education. The law also permits the president or other chief executive officer of an institution of higher education to establish reasonable rules, regulations, or other provisions regarding the carrying of concealed handguns by license holders on the campus or on specific premises located on the campus. “Senate Bill 11 when into effect at four-year universities in August 2016 which allowed two-year institutions the opportunity to observe best practices on implementing the law,” said Head. The law allows the posting of a sign under Penal Code Section 30.06 with respect to any portion of premises on which license holders may not carry. Visit LoneStar.edu/CampusCarry for more information, including a video, Frequently Asked Questions and list of exclusionary zones for each LSC location. (AUSTIN) — Texas Comptroller Glenn Hegar reminds shoppers they can save money on certain items during the state’s annual sales tax holiday. This year, the sales tax holiday is scheduled for Friday, Saturday and Sunday, Aug. 11-13. Lists of apparel and school supplies that may be purchased tax-free can be found on the Comptroller’s website at TexasTaxHoliday.org. This year, shoppers will save an estimated $87 million in state and local sales taxes during the sales tax holiday. Texas’ tax holiday weekend has been an annual event since 1999. NORTHEAST – Homeowners from four local subdivisions packed the hall at Hambrick Middle School last Thursday night, to hear government officials and water utility companies explain how the water quality crisis in their locales developed, and what remedy is being proposed to resolve the problems. 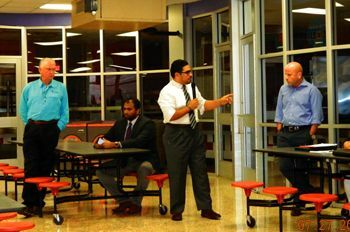 The Town Hall meeting was organizaed by State Representative Armando Walle, after his office received numerous complaints about water that either was unfit to drink, or not available at all in the system. Four subdivisions were served by Suburban Utility company, including Castlewood, Beaumont Place, Reservoir Acres, and Cypress Bend. There are about 1400 customers in these four areas, and many of them were in the audience. Complaints started in 2013, when Suburban added a surcharge of $60 to monthly bills. As water quality became worse, homeowners asked the state for relief from higher bills and lower service. Eventually the state and the courts forced Suburban to pay a fine of $225,000 and promise to improve service. When they failed to meet terms of this injunction, the court ordered the utility into receivership, and the sale of the utility to a new owner. Instrumental in getting this ruling were delegates from Castlewood, who travelled to Legislative hearings in Austin, and an attorney furnished by the East Aldine District who argued the case before the District Court. In a called special session of the board of the East Aldine District, on Wednesday, July 26, the district authorized an increase in legal fees to continue the legal battle to get adequate water service for the Castlewood subdivision. Present at this meeting were Castlewood president Steve Adame, Sr. and VP Connie Exparza. Representing the State of Texas at this Town Hall meeting were representatives from three agencies that have been involved in the water crisis: TCEQ (Texas Commission on Environmental Quality), PUC (Public Utility Commission), and OAG (Office of the Attorney General). The TCEQ said they were in the process of getting a new owner for the utilty, and working with them to improve the system. This designated or prospective new owner is Undine LLC. As allowed by law, the TCEQ has appointed a temporary manager, Quadvest LP, to manage the system until a transfer can be made. The PUC said that they had approved a temporary rate increase for the six months that Quadvest will mange the system, to try to generate enough money to operate they system properly. However, the homeowners present were not happy with this news, saying they were already paying the increase and that it amounted to a 165.3% increase in their monthly bills. They questioned the justification for this increase, especially when many of them had interupted water service, and discolored and foul tasting water. Officials said that they had granted the increase, based on a filing and administrative hearing from Quadvest that justified the necessity for the increase. They explained that rates and increases are based on information provided on operating costs, maintenance, and capital improvement budgets. Representatives from the OAG indicated they had an ongoing investigation of the circumstances surrounding Suburban’s failures, including the fact that they have not paid the $225,000. They have paid $61,000 of the fine, had a $100,000 amount held in abeyance, and were paying $4000 monthly to pay off the court order. The OAG officials indicated they are working with the TCEQ to handle the details of a transfer to a new owner, which is scheduled to take place on September 23, 2017. TCEQ action in this case dates back to April 2013 when they first filed against Suburgan for compliance with legal requirements of a water utility system. However, it was noted that if the sale is not concluded, that the utility could resort back to Suburban Utility company. Although the water system is currently being operated by a temporary manager, the Quadvest representative, Jerry Hayley, said they are not interested in assuming ownership and operation of the system, citing heavy losses in the short time they have managed. He indicated that Quadvest planned on returning “prepayments” to homeowners, but Suburban’s lack of adequate records is making this difficult. A new prospective buyer, Undine LLC, was present at the meeting. Their representative, Rick Melcher, said that they would assume ownership and operation after Sept. 23, 2017 if due diligence is favorable and the state approves the transfer. He said that Undine plans on improving the physical plant and pipes of the four subdivisions, and no rate increases will take place for two years until Undinve has completed system upgrades. He said the rates would revert to previous base rates. Undine is a relatively new water utility company, with two years experience and two other water systems in Texas. However, their principles have over 20 years of experience with other companies. He indicated that they can promise rate stability due to their ability to access capital for long term upgrades. Questions from the audience included whether grant money was available to pay for system improvements, including federal CDBG block grants; and whether their water was safe to drink. Quadvest Operations Manager Ryan Quigley gave a two part answer to this, saying tests indicates it meets state standards, but he cautioned if it is discolored he would not drink it. 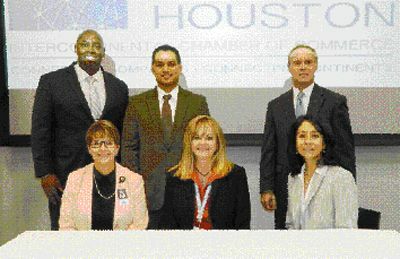 HOUSTON [July 17, 2017] – Collaboration between government, businesses and Houston Community College (HCC) brings great educational opportunities. An example is the opening of the HCC Acres Homes campus, a state-of-the art 25,120 square foot facility that will offer academic programs, workforce training, certificates and adult education. The ribbon cutting took place on Monday, July 17, 2017 at the campus. Houston Mayor Sylvester Turner, who grew up in Acres Homes, was one of the guest speakers. For HCC Chancellor Cesar Maldonado, this is what transformation is all about. For Mayor Sylvester Turner, this ceremony has special personal significance. 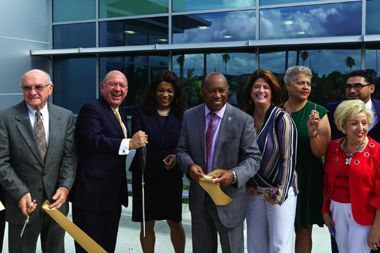 “I am so happy to be in my neighborhood, the place where I grew up and attended public schools, to celebrate the grand opening of the Houston Community College Campus in Acres Homes,” said Mayor Turner. The new Acres Homes Campus will include workforce, academic and continuing education programs, a combination of classrooms, student lounge, academic/computer labs, electronic resource library, multi-media space, administration and support spaces and a multi-media space. 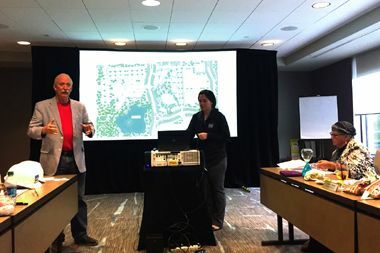 NORTHEAST – Board members of the East Aldine District gathered in the Woodlands last month, for a planning retreat. The district is observing its 15th anniversary this year, and has been guided by a Service Plan laid out at the beginning. Now the district feels it is time to update that plan, evaluate its relevance, and restate goals for the next five to fifteen years, according to Executive Director David Hawes. The all-day retreat started by focusing on accomplishments, through a video prepared by the staff of district activities over the last fifteen years. Committees of board members and the public have worked in each of these areas over the years. The retreat discussed each of these areas, and how they could be re-interpreted and implemented in the future. Also discussed was the new Town Center project on Aldine Mail Route, and the proposed construction of a new building for the functions of the district, including offices and public spaces.